RIPLEY We’ve spotted SOMETHING! and its heading to ACGHK 2018. Comme des Garçons PLAY should be rolling around right now seeing Fools Paradise mashup of Alien vs Predator playing the classic Crocodile Dentist game, HA. 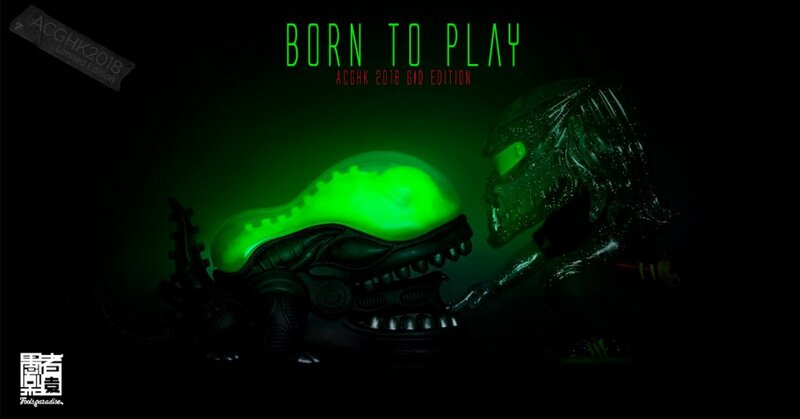 Making a return is #1 Born to Play Glow in the Dark edition, already for ACGHK 2018. Don’t be too sad if you can’t make it to the show as worldwide fans can pre-order online! So no need to be salty with this release if you can’t go. With greater ambitious for a bigger dream, B.O.A.T. sails out again. This year, more artists from different countries and regions, over forty units will join B.O.A.T. Fair. Miloza Ma, Hong Kong famous toy figure designer, illustrator and comic creator, was invited to design the event main visual. Miloza created a wonderful poster inspired by the ocean in her own colour. Special thanks to the main organizer In Express Expo and all our friends who participated or contributed to this event. With a great collection of figures, art toys, illustrations, sculptures and drawings, we hope everyone will enjoy this Journey of Creativity brought to you by B.O.A.T.